Oh-my-goodness. Last night, I left for my run with my mouth agape. Seriously agape. Runners, we like to talk, and not just about your run-of-the-mill, how’s-the-weather kind of stuff. We talk about everything – hello, runner’s diarrhea, need I say more? Some of the stuff I’ve heard and some of the stuff I’ve said in any other situation would stop people in their tracks and have them slowly backing away for safety. But because we’re all runners, pretty much anything goes. Last night, though, I finally found a runner who actually did manage to shock the heck out of me. And not in a good way. This woman is training for a half marathon, which in itself is no easy feat, but she’s trying to do it on a low-carb diet! Are you kidding me? On a normal day, in a normal world, where I’m not eating-drinking-sleeping-breathing running, I can’t live without carbs. But as a runner, no one can. Because marathon runners burn through carbs like they’re going out of style, their diet should consist of about 65 to 70 per cent carbs. Carbs are your energy source, they’re the fuel for your body and brain, they’re huge in getting you to the finish line. And without them, you’re burning through your liver glycogen stores, which is not good. Runners know it as bonking or hitting the wall. But us diabetics, we know it as hypoglycemia or low blood sugar. Either way, the effect is the same: Your brain goes to mush, you can’t focus, you’re confused, shaky, irritable, not all there. And worst case scenario, you fall into a coma. And from first-hand experience, on the diabetic end of things, recovering from that, not fun! So, needless to say, you won’t ever catch me scrimping on carbs. Oh no. Bring on the pasta and fruit and oatmeal and granola and corn and carrots and beans and yeah, banana bread too! Even with my decent carb intake, though, I have been feeling majorly hungry lately, to the point of an embarrassingly loud, growling belly. Wednesday was probably my worst day this week. I had breakfast at 7 a.m., got to work at 8:30, had a high fibrous granola bar, was still hungry, had a Laughing Cow cheese triangle, was still hungry and was seriously running out of snacks, so by 10:30 a.m. I was hitting the chocolate drawer (what? you don’t have one? :D). I had lunch at noon, which didn’t fill me up, and was pilfering sunflower seeds off my co-workers desk by 1:30, got a Starbucks tea at 2, had a Quaker granola bar at 3:30 and by the time I was at Mill Lake meeting up with my running gals, my stomach was in full blown bear mode. Google, my friend, helped me discover that snacks like banana bread (which I just so happened to have in my freezer) and peanut butter and jelly sandwiches or peanut butter and banana sandwiches, and granola and yogurt (which I do so love) are great sustainable snacks. 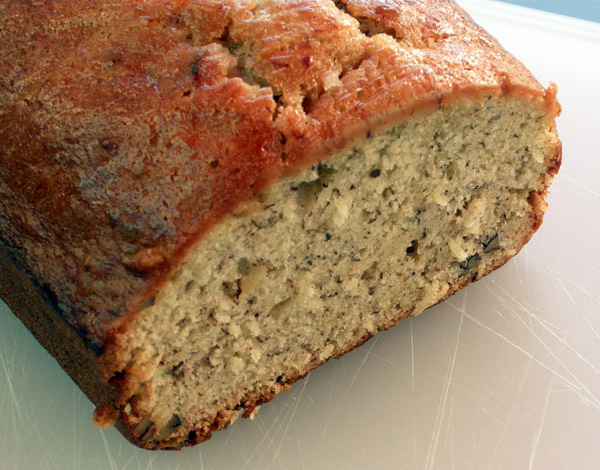 I tried out the banana nut bread for my morning snack both yesterday and today and it worked beautifully. Just a question. Have you ever tried adding some peanut butter to your oatmeal?